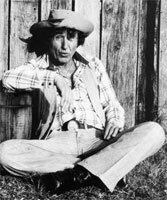 Pseudonyme de Sheb Wooley lorsqu'il chantait de la Country parodique. 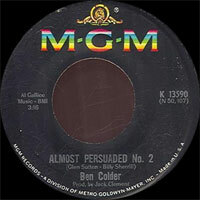 Ben Colder was the alter ego of singer Sheb Wooley (of "Purple People Eater" fame), which he used specifically for recording parodies of country hits. Due to various acting commitments, Wooley had been unable to record the song "Don't Go Near the Indians," which was instead cut by Rex Allen for a significant hit in 1962. Wooley recorded a drunken-sounding parody called "Don't Go Near the Eskimos" and released it under the pseudonym Ben Colder (other choices reportedly included Ben Freezin and Klon Dyke). "Eskimos" was a Top 20 hit on the country charts, and Wooley decided to keep returning to his new comic persona on a regular basis. "Hello Wall No. 2" went Top 30 in 1963, and "Almost Persuaded No. 2" went all the way to number six in 1966, giving Wooley the second-biggest country hit of his career. 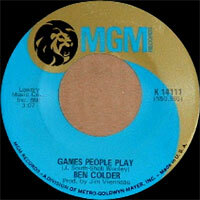 Ben Colder had a few more chart singles through the '60s, including "Harper Valley P.T.A. (Later That Same Day)" and "Little Green Apples No. 2," and continued to release albums on MGM through the '70s. Thanks to his penchant for comedy, Wooley was tapped as a staff songwriter for the television series Hee Haw when it debuted in 1969. Colder made a comeback in 1996 thanks in part to Billy Ray Cyrus, who inspired the title track of Shakey Breaky Car.